Comics: Sonic the Hedgehog #13 (Archie Comics), Sonic the Comic #33 (Fleetway). Animation: Sonic Underground episode (#16), "Friend or Foe?". So, who is this echidna? He's the Guardian of the Floating Island. According to the game manuals, he's 15 years-old (16 in Sonic Adventure) and likes fruit (especially grapes). He has a pair of spike-like knuckles on each hand (hence his name ;) and a white "ring" on his red bod'. In Archie comics' continuity, this ring only appears on direct (blood) decendants of the first Guardian, Edmund. The Sonic Adventure instruction booklet describes him as "honest, single-minded, and very serious about his mission, and easily tricked by others". Well, he can use his funky knuckles to climb and can glide. He's quite strong, too--he can punch down doors, and even piles of rock! 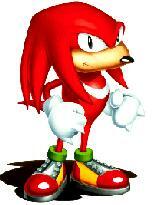 According to Knuckles the Echidna #25 (Archie Comics) he's also the functional equivalent of a (living) Chaos Emerald. As noted above, he's the Guardian of the Floating Island. That means it's his duty to keep the peace--usually by keeping outsiders from causing trouble on the island. It also means that he guards the Master Emerald, which keeps the island floating. Knuckles was born and raised on the Floating Island and he knows all of its secrets. He's strong, athletic, and clever. Because Knuckles knows every hidden passageway on the island, it's easy for him to block Sonic's path, create extra obstacles, set traps and steal Sonic's gold rings. Long ago, an ancient civilization lived on the Floating Island. Before this civilization mysteriously disappeared, it left behind many secrets and mystical powers. Being the only living descendant of this lost civilization, Knuckles has become the guardian of the Chaos Emeralds, which are the source of the island's special floating power.